Singer/songwriter/producer Quinn XCII is already preparing to make a massive splash in 2019. The Columbia Records artist just announced that his sophomore album, entitled From Michigan With Love, is set for release at the top of the year. Quinn XCII has also revealed the schedule for a major headlining World Tour for early next year, under the bill “From Tour With Love.” The 37-show trek kicks off in Europe at the beginning of February. The North American dates of the tour, produced by Live Nation, kick off February 19 in Indianapolis, IN and will stop in major markets including New York, Chicago, San Francisco, Los Angeles and more, before wrapping April 17 in Austin, TX. Tickets are available beginning tomorrow via Spotify pre-sale and Thursday via local pre-sales, with general on sale starting this Friday, November 9 at 10am local time at LiveNation.com. The genre-bending artist is continuing 2018 strong with the recent release of tracks “Sad Still” and “Werewolf” ft. Yoshi Flower, which marked his first two releases since his debut album The Story of Us last year. Both “Sad Still” and “Werewolf” will be included on From Michigan With Love. The rising artist has accumulated an impressive 500 Million streams on Spotify alone from his catalog, and over 75 Million combined views on YouTube. 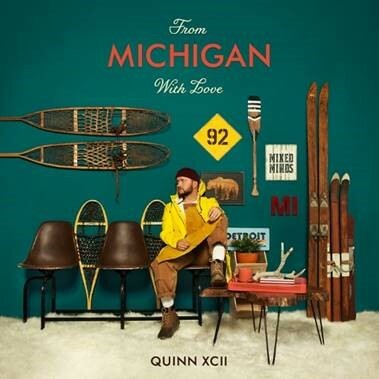 With his ability to seamlessly blur the lines between pop, hip-hop, electronic and soul, Quinn XCII has quickly paved his own lane with his unique sound. He released his debut album, The Story of Us, in September 2017 via Columbia Records. The album debuted at #6 on the iTunes Pop Chart and is led by rising standout single “Straightjacket“, which has accumulated more than 55 million streams on Spotify. Earlier this year, he released the deluxe edition of The Story of Us, which features four brand new songs – including island-breezy, reggae-influenced song, “Iron & Steel.” He completed back to back sold-out headline tours across North America off the success of the album, selling over 60,000 tickets, and made multiple major festival appearances this summer at the likes of Outside Lands, Osheaga, Governor’s Ball and Lollapalooza. Quinn XCII has also recently been featured on Gryffin’s ‘Winnebago’ (18M streams), Phoebe Ryan’s ‘Middle Finger’ (10M streams), and Louis The Child’s ‘The City’ (9M streams).